Collinsville is a city in Southern Illinois in the Saint Louis Metro East area. 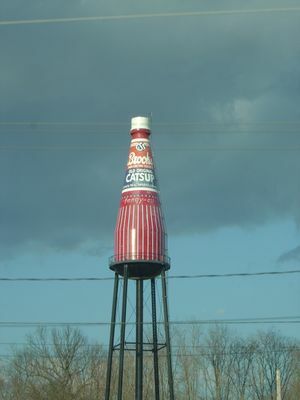 The "Horseradish Capital of the World," 85 percent of the world's horseradish is grown in Collinsville and the surrounding area. Collinsville is a small city and is a suburb of St. Louis in the Metro East. It is roughly in the middle of a string of towns extending from Edwardsville to Belleville. The city consists mainly of the original town on the river bluff and an expansion built up around I-70 at the base of the river bluffs. This part has all/most of the major restaurant chains, hotels, and several "big box" stores. You will also find the Gateway Conference Center  in this area. Up on the bluff you will find the older part of the city. It is largely a white, blue-collar midwestern town. It has more of a small-town feel than a suburban feel. The original downtown is called "uptown"  to differentiate it from the newer commercial area by I-70. Although it was run-down for the past few decades, "uptown" is currently seeing a revitalization. Collinsville is located at longitude 90W, making it one quarter of the way around the world from Greenwich. Check the weather forecast for Collinsville from NOAA. The Mississippi River makes this area humid, though temperatures are generally moderate. Storms can occur at any time of the year. July and August are hottest and most humid, and January and February are cold, with occasional snow. Average temperatures range from 21°F in the winter to 90°F in the summer (-6°C to 32°C), but summer highs of 100°F and winter lows of 0°F are not uncommon (38°C and -18°C). Most people will arrive by car via I-55/70. Most people will get around by car. MCT  provides bus service in the city. There isn't much in the way of shopping in Collinsville. There are a handful of retail stores in "uptown" and a couple of big box stores in "downtown". Most people in Collinsville will drive to Fairview Heights to shop. Most major chain restaurants and fast food franchises are located along 157 near the intersection of 55/70. "Uptown" Collinsville (it's Main Street/traditional downtown) has unique, locally owned dining options including Asian eatery Peking Garden, bar and grill Friday's South, bar and grill Hurricanes, bar and grill Fifth Quarter, tex-mex & bbq joint Bert's Chuckwagon and tea room The Oatman House. There are several bars mainly concentrated in "Uptown" Collinsville some are more upscale and some are dives. The Fifth Quarter - A sports themed bar & grill. Friday's South - a newer bar & grill. You'll find most major hotel chains around the Gateway Conference Center. This page was last edited on 29 December 2014, at 19:32.